Which team will win the German Bundesliga 1 in 2012-2013? With just under 3 weeks to go until the start of the “Golden Jubilee” Bundesliga season we take a look at the 18 teams in contention for the title and statistically assess their chances of winning the Meisterschale next May. Hamburger SV are the league’s longest servants, ever-present since its formation in 1963. Their record of 3 title wins, 5 runners-up finishes, and twice 3rd in 49 years hasn’t really troubled the statisticians, and 15th place last season was a narrow escape from possible relegation. Never in the history of Bundesliga 1 has a team finished so lowly in a preceding season and then gone on to win the title. This fact is perhaps reflected in the bookmaker odds with Stan James currently offering best price at 201.00! This might be worth taking in the hope that Hamburg start the season well enough to trade out for a profit. Looking more at the stats, it can be further surmised that the likelihood of a team finishing 11th or lower improving enough to win the championship the following season is extremely low, although not absolutely zero, as are the chances of a team arriving from Bundesliga 2 and then immediately winning the top-flight division. 1. FC Kaiserslautern are the one team who have most recently defied this rule of thumb, winning the title in 1990-91 after a 12th placed finish the previous season, and more impressively triumphing in 1997-98, when they became German champions having spent the previous season in Bundesliga 2. Many commentators still attribute the latter success to the inspired leadership of Otto Rehhagel, one of Germany’s most famous and successful managers who took on the challenge of turning an unfashionable team into championship winners. Hoffenheim currently best priced at 201.00, with Stan James. Mainz are 380.00 with Betfair. Freiburg at 1,001.00, again with Stan James. Augsburg seemingly have no chance at a price of 1,501.00, once more through Stan James. As they say, Augsburg have 2 hopes of winning the league: Bob Hope and no hope. The 3 newly promoted teams are likewise given little chance by the bookies and you can get odds of 1,001.00 on Fortuna Düsseldorf, Eintracht Frankfurt and Greuther Fürth from both Paddy Power and Blue Square. There is a 16.7% statistical chance based on the previous 49 seasons that a team finishing in 6th-10th place last season will win this season’s title. It has happened on 8 occasions since 1963. This means that Stuttgart, Hannover, Wolfsburg, Werder Bremen and Nuremberg should all have improved chances of claiming the prize than any of the aforementioned teams. 16.7% means that on average, Germany heralds an unexpected champion every 6 years. In 2006-07 Stuttgart came from 9th the previous year to win the top-flight; in 2003-04 Werder Bremen won the league after placing 6th the previous season. Odds of 62.00 are available via Betfair for Stuttgart to claim this season’s crown. Wolfsburg can be backed with Betfred at a price of 81.00. The odds for Werder Bremen are best with Stan James at 151.00. Hannover are 171.00 with Betfair. Nuremberg are the rank outsiders of this group at a best price of 501.00 with Stan James. The statistical likelihood that a team finishing in 3rd to 5th position in the previous season wins the next is as high as 29.2%. The clubs in this bracket are Schalke, Borussia Mönchengladbach and Bayer Leverkusen. If we had a soft spot for any of them it would be for Schalke to finally claim their maiden Meisterschale at only their 45th attempt. Schalke are the favourites from this group priced at a modest 26.00 with Betfair. Bayer Leverkusen can be backed at 67.00, also with Betfair. Borussia Mönchengladbach are 81.00 with Stan James. Top of the shop are of course defending champions Borussia Dortmund and Bayern Munich. 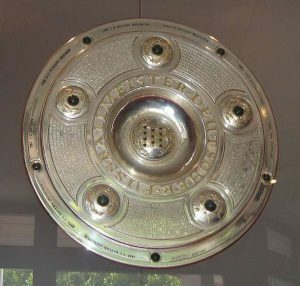 On 15 occasions, the defending champions have successfully defended their title, however 9 of these triumphs are firmly lodged in the record books of Bayern. Disregarding this for a moment, the pure statistical chance of Dortmund winning in 2012-13 is as high as 31.25%, but in 45 seasons they have managed a ‘double’ only twice, and have never won the title 3 times in a row. Bayern have accumulated 21 titles in their 47-year league history and their success rate is therefore a massive 44.7%; roughly speaking they win the Bundesliga once every 2 years. To calculate the exact mathematical odds there are several approaches but these are beyond the scope of a short article such as this. Nevertheless, the fact is that no matter how the calculation is performed, Bayern and Dortmund have a statistical likelihood combined of around 50% of winning the 50th Bundesliga title, which of course means 50% any other team. For those of you seriously considering a season-long investment on the Bundesliga winner, we advise to avoid backing Bayern or Dortmund as their odds carry hefty negative values. Bayern’s best odds are currently around 1.87 and Dortmund’s are at 2.90. However, realistically speaking, both should be somewhere in the region of 4.0. Combining the market’s prices of these two teams produces a whopping 87% chance that one of the two will win the Deutsche Meisterchale in 2012-13. This is more than 40% below the long-term value, and therefore in the long-run more bets of this nature will be lost than won. A nice alternative would be a “Dutch” lay bet on Dortmund/Bayern, risking 1.50 units to win 10 units with a 50/50 chance of success. Now that’s what we call a true ‘value’ bet! It’s certainly going to be an exciting season ahead and a battle royale for the “Jubilee” title. If you are wagering money on the final outcome then please be aware that the findings above are purely based on statistics and not on any major changes in team personnel over the close season. Never bet more than you can afford to lose and thanks once again for reading! I’m relieved I found this article because this subject is exactly what I’m searching for (writing a university paper). I hope you don’t mind if I collect some information from here and of course, I’ll credit you as the source. Thanks for your time. Entschuldigung, mein Deutsch ist auch nicht so gut! Now Shinji Kagawa has transferred to Manchester United perhaps Dortmund’s creativity will be detrimentally affected? With Schweinsteiger fully fit, Bayern should be a much better team this season – they struggled without him for long periods last season. My money would be on Bayern to win back their crown (and Man United to reclaim theirs). I think Dortmund will win the title. FC Bayern will become many problems with new Team. Mandzukic will replace Gomez in storm. Robben and Ribery will have new disputes and perhaps Jupp Heynckes must go. Bayern has to many problems to focus on the title. Sorry mein English ist nicht so gut.